Senior Dylan Rieken reached 1,000 career points with a game-high 26 points in Saturday's 70–38 win over Iowa–Grant Saturday night. POSTED February 14, 2019 1:53 p.m.
HAZEL GREEN – With a loss to Fennimore last Friday night, followed by a pair of wins on Saturday and this past Monday over Iowa-Grant and Riverdale, the Southwestern varsity boys’ basketball team sits at 6-5 in the Southwest Wisconsin Activities League standings. Coach Clint Nemitz’ squad traveled to Fennimore last Friday night, where they were sent home with a 53-39 loss. The Wildcats struggled against the Golden Eagles in the first half, trailing, 33-16, at the intermission, but then outscored their opponent, 23-20, in the second half. As a team, the Wildcats made 15-of-52 (29%) shot attempts, including 5-of-27 (18.5%) from 3-point range. They were 4-of-8 (50%) from the free throw line, all coming in the second half. Preston Pearce, Breckin Schneider and Cayden Splinter each finished with eight points in the loss, Schneider also pulling down a team-high six rebounds and blocking two shots, and Riken having two assists and one steal. 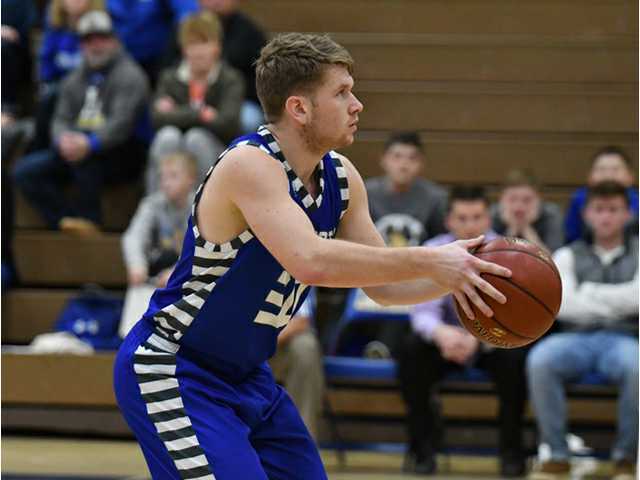 Saturday night’s home game against visiting Iowa-Grant was a historic moment for senior Dylan Rieken, who became the fourth player in Southwestern basketball history to score 1,000 career points. Rieken led all scorers on Saturday with 26 points, as the Wildcats cruised to a 70-38 victory over the visiting Panthers. As a member of the 1,000-point club, Rieken joined Glen Stangl, Mike Lambe and Brandon Temperly as the only players to reach the milestone. In attendance for Rieken’s big night was coach Jim Nedelcoff, a longtime teacher and hall of fame coach at Southwestern, whom the gymnasium at Southwestern High School is named for. A total of 11 players scored for Southwestern last Saturday night, as Pearce finished with nine points and six rebounds, followed by Schneider with eight points and Justin Wilson and Vaughan Lacey each with six. As a team, the Wildcats made 24-of-42 (57%) shot attempts, including 7-of-16 (44%) from 3-point range. They were 15-of-26 (58%) from the free throw line and committed just seven turnovers. This past Monday evening, the Wildcats traveled to Muscoda, where they picked up a 71-34 victory over host Riverdale. Rieken led the Wildcats with 12 points, while Schneider and Pearce each finished with 11. This week, the Wildcats travel to Darlington Friday night, and then host Cuba City on Saturday.